To scale an application and provide a reliable service, you need to understand how the application behaves when it is deployed. You can examine application performance in a Kubernetes cluster by examining the containers, pods, services, and the characteristics of the overall cluster. Kubernetes provides detailed information about an application’s resource usage at each of these levels. This information allows you to evaluate your application’s performance and where bottlenecks can be removed to improve overall performance. The resource metrics pipeline provides a limited set of metrics related to cluster components such as the HorizontalPodAutoscaler controller, as well as the kubectl top utility. These metrics are collected by metrics-server and are exposed via the metrics.k8s.io API. metrics-server discovers all nodes on the cluster and queries each node’s Kubelet for CPU and memory usage. The Kubelet fetches the data from cAdvisor. metrics-server is a lightweight short-term in-memory store. A full metrics pipeline, such as Prometheus, gives you access to richer metrics. In addition, Kubernetes can respond to these metrics by automatically scaling or adapting the cluster based on its current state, using mechanisms such as the Horizontal Pod Autoscaler. The monitoring pipeline fetches metrics from the Kubelet, and then exposes them to Kubernetes via an adapter by implementing either the custom.metrics.k8s.io or external.metrics.k8s.io API. The Kubelet acts as a bridge between the Kubernetes master and the nodes. It manages the pods and containers running on a machine. Kubelet translates each pod into its constituent containers and fetches individual container usage statistics from cAdvisor. It then exposes the aggregated pod resource usage statistics via a REST API. cAdvisor is an open source container resource usage and performance analysis agent. It is purpose-built for containers and supports Docker containers natively. In Kubernetes, cAdvisor is integrated into the Kubelet binary. cAdvisor auto-discovers all containers in the machine and collects CPU, memory, filesystem, and network usage statistics. cAdvisor also provides the overall machine usage by analyzing the ‘root’ container on the machine. Many full metrics solutions exist for Kubernetes. Prometheus can natively monitor kubernetes, nodes, and prometheus itself. The Prometheus Operator simplifies Prometheus setup on Kubernetes, and allows you to serve the custom metrics API using the Prometheus adapter. Prometheus provides a robust query language and a built-in dashboard for querying and visualizing your data. Prometheus is also a supported data source for Grafana. 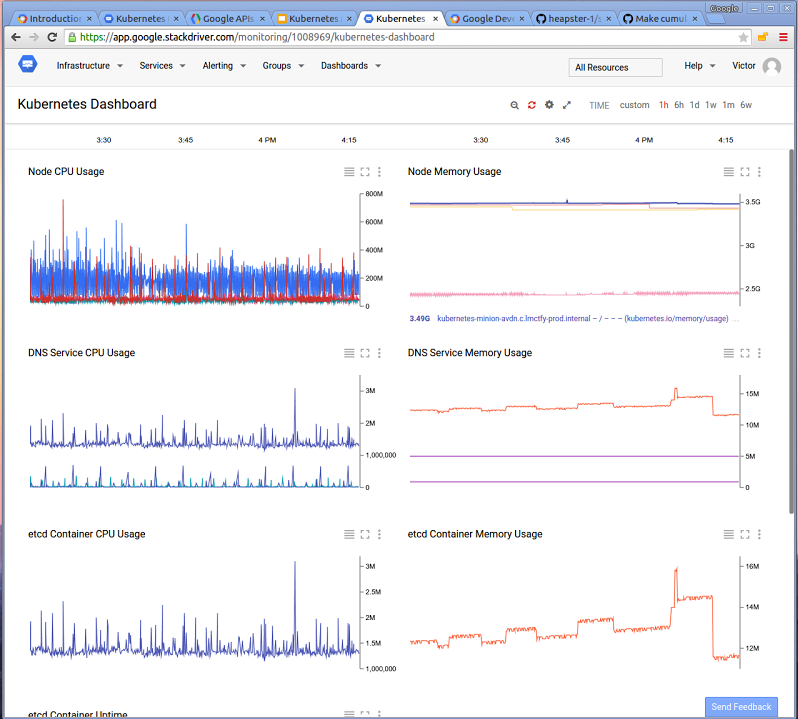 Google Cloud Monitoring is a hosted monitoring service you can use to visualize and alert on important metrics in your application. can collect metrics from Kubernetes, and you can access them using the Cloud Monitoring Console. 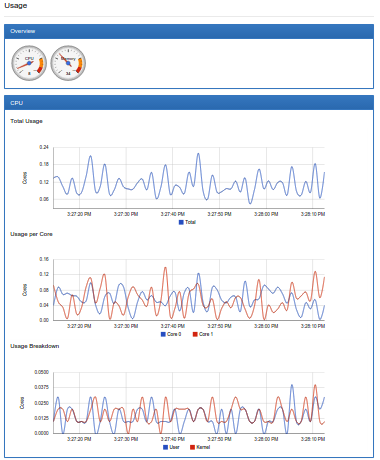 You can create and customize dashboards to visualize the data gathered from your Kubernetes cluster. This dashboard shows cluster-wide resource usage. With the Kubernetes Job Monitor dashboard a Cluster Administrator can see which jobs are running and view the status of completed jobs. New Relic Kubernetes integration provides increased visibility into the performance of your Kubernetes environment. New Relic’s Kubernetes integration instruments the container orchestration layer by reporting metrics from Kubernetes objects. The integration gives you insight into your Kubernetes nodes, namespaces, deployments, replica sets, pods, and containers. Marquee capabilities: View your data in pre-built dashboards for immediate insight into your Kubernetes environment. Create your own custom queries and charts in Insights from automatically reported data. Create alert conditions on Kubernetes data. Learn more on this page.